Before we begin, let us get the key specifications of the phone listed out. The Vivo V9 was a big hit with the Indian buyers. After that, it looks like the Vivo product and design team have been working hard on making a successor that is a compelling buy and has a bevvy of interesting and useful features. And they have succeeded in getting together a wonderful package that the young buyer will find very interesting. Brands have been struggling to find practical solutions to fit more screen space into the existing phone frames without changing the aspect ratio. Vivo had come up with the motorized camera on the Vivo Nex for the flagship users. 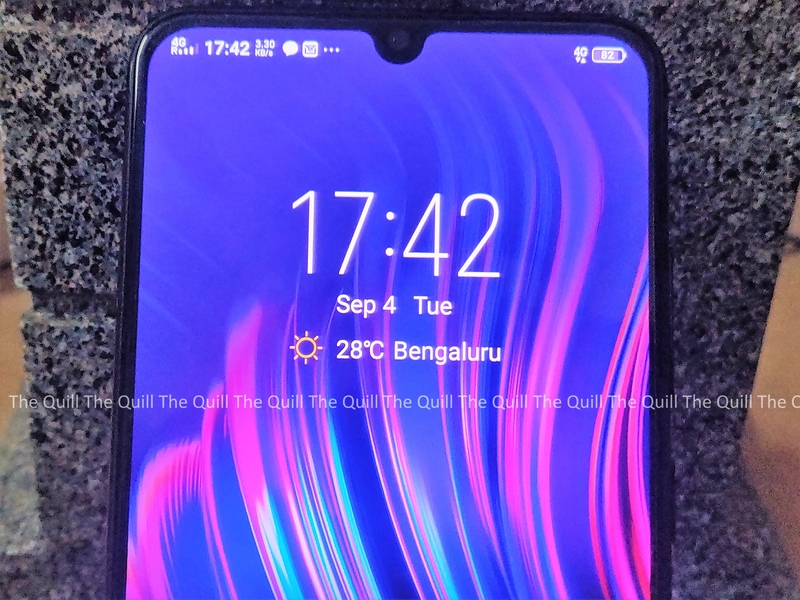 The waterdrop notch on the Vivo V11 Pro is a masterstroke that eliminates the motorized part and brings a bigger screen experience to the mid-range buyers too. The notch is so small that you hardly notice that it is there and eventually you see that the screen is immersive and vivid. It helps a lot when you are someone who uses their phone as their primary productivity device. There is also the added benefit that the notification area is bigger and can hence accommodate more information that you need to see at a glance. Because of this, the 16.29 cm-big super AMOLED screen has a 19.5:9 aspect ratio and a 91.27% screen-to-body ratio and something Vivo calls the Halo Full-View display. This is an even better screen to body ratio than the Vivo Nex and even the iPhone X. All thanks to the small notch. Again, there is another problem that many brands are grappling with – where to position the fingerprint scanner. People prefer to have it in the front so that they can unlock the phone even when it is lying on a table. When the scanner is on the rear, the design and ease of use become a tad bit limited. Vivo is the trendsetter in this area, they came out with the first in-display fingerprint scanner in the market and there was a second iteration in the Vivo Nex. The in-display fingerprint scanner on the Vivo V11 Pro works better on this device, much better than the Nex . The technology has been improved to make it better and faster and it is very clearly visible in day-to-day use. The in-display scanner also makes the phone nifty and easy to use. Added to that is the fact that it turns heads around you when you use it in front of others will make it very attractive to young users. The V11 Pro comes with a 25-megapixel front camera and a 12-megapixel and a 5-megapixel on the rear. The camera department is something that Vivo has been using as a selling point in their devices and the V11 Pro is no exception. The camera performs well in good lighting and consistently churns decent pictures with good colors. The bokeh mode is good and creates good outlines with very professional background blurring. There are a whole lot of options in the camera interface that will ensure that you are never out of choices when you need to capture moments to store for remembrances. The AI that has been baked into the camera at all levels is a major help in churning out good pictures consistently from the device. Even when you are taking a selfie the AI feature helps you add a whole lot of unique features to your picture, my favorite is the color pop when you are in color and the background is rendered in monochrome. The AI assisted bokeh mode is also very efficient with professional blurring and crisp outlines. These are the three reasons why the Vivo V11 Pro is a value smartphone and will definitely give you an advantage over the other options. Do let me know if you have any other features to add to this list.